White rice flour is often used in baking as a healthier alternative to wheat flour. What is White Rice Flour? It is a flour produced from grinding polished white rice without the bran layer. 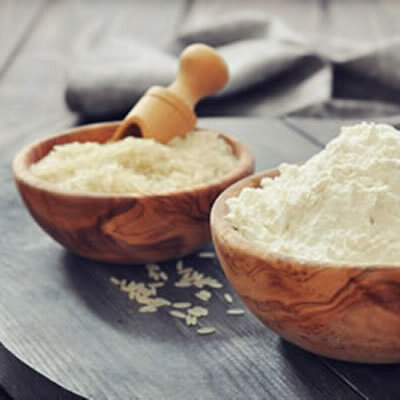 White rice flour has around 7–10% protein, 75–82% carbohydrates, 0.7–1% fat.3 White rice flour milling removes the fat and micronutrient-rich bran layers. Therefore, 75–90% of vitamins B1, B6, E, and niacin are removed in this process.1 The iron level is brought down from 2.6 mg/100 g to as low as 0.4–0.6 mg/100 g.1 Iron is considered one of the most limited micronutrients in diets based mainly on polished rice. White rice flour is enriched with vitamins and minerals to meet the nutrient requirements. Rice flour is gluten-free; therefore, individuals with celiac disease can safely consume it. It is often used as a healthier alternative to wheat flour because it is easier to digest and richer in fiber. However, because it is gluten-free, it is not able to produce the same quality and variety of products as seen in wheat flour breads and other products. It is a popular substitute for wheat flour with the addition of other flours, starches, gums, and enzymes to help mimic a gluten matrix. Because rice posses unique nutritional, hypoallergenic, colorless, and bland taste properties, it is used in baby foods and puddings. Its role in development of foods for gluten-intolerant patients especially has been increasing. But the use of rice flour in breadmaking is still limited because rice proteins are unable to retain the gas produced during the fermentation process. Steiger, G., et al. “Fortification of rice: technologies and nutrients.” Annals of the New York Academy of Sciences, 2014, pp. 29–39, doi:10.1111/NYAS.12418. Delcour, J.A., and R.C. Hoseney. “Chapter 10 Rice and Oat Processing.” Principles of Cereal Science and Technology, 3rd ed., AACC International Inc., 2010, pp. 156–157. Verma, D.K., and P.S. Prem. “Proximate Composition, Mineral Content and Fatty Acids Analyses of Aromatic and Non-Aromatic Indian Rice.” Rice Science, vol. 24, no. 1, 2017, pp. 21–31, doi:10.1016/j.rsci.2016.05.005. Gujral, H.S., and M.R. Cristina. “Functionality of Rice Flour Modified with a Microbial Transglutaminase.” Journal of Cereal Science, vol. 39, no. 2, 2004, pp. 225–230, doi:10.1016/j.jcs.2003.10.004. Gujral, H.S., and M.R. Cristina. “Improvement of the Breadmaking Quality of Rice Flour by Glucose Oxidase.” Food Research International, vol. 37, no. 1, 2004, pp. 75–81, doi:10.1016/j.foodres.2003.08.001. Kringel, D.H., et al. “Influence of Phosphorylated Rice Flour on the Quality of Gluten-free Bread.” International Journal of Food Science & Technology, vol. 52, no. 5, 2017, pp. 1291–1298, doi:10.1111/ijfs.13376. US Food and Drug Administration. “21CFR170.30 – Code of Federal Regulations Title 21.” Accessdata.fda.gov, www.accessdata.fda.gov/scripts/cdrh/cfdocs/cfCFR/CFRSearch.cfm?fr=170.30. Accessed 29 Aug. 2017.